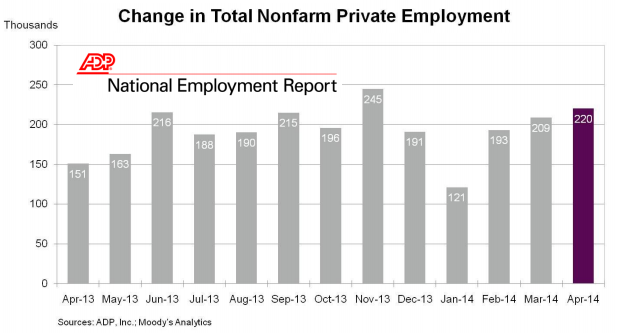 ADP said there were 220K private jobs created in April and they revised the March number from 191K to 209K. A little better than 210K expected but didn’t cause a lot of reaction because fifteen minutes later Commerce released the advance GDP report for Q1, it was expected to have slipped from +2.6% in Q4 to +1.1%, as reported the advance GDP was a feeble 0.1%. Prior to the ASDP data the 10 yr note traded -2/32 to 2.70% after the two reports in fifteen minutes the 10 was unchanged. The very weak GDP, while scary on its surface, the weather in Q1 likely had more negative impact on the economy than what had been thought. Keep in mind that this is the advance report and always is revised a month later when the preliminary report includes more data from the third month of the quarter. We believe when we see the preliminary report in a month the revision will be higher. Since the end of Q1 and the end of weather issues, gains in retail sales, employment and manufacturing at the end of the quarter indicate the setback will be temporary. Within 30 minutes of the releases of the data the stock and bond markets were essentially unchanged. In 2013 GDP was up 1.9%, falling from +2.8% in 2012. The weekly MBA mortgage applications as on Wednesday were released early this morning and the data wasn’t good. The Market Composite Index, a measure of mortgage loan application volume, decreased 5.9% on a seasonally adjusted basis from one week earlier. The Refinance Index decreased 7% from the previous week. The seasonally adjusted Purchase Index decreased 4% from one week earlier. The unadjusted Purchase Index was 21% lower than the same week one year ago. The refinance share of mortgage activity decreased to 50% of total applications from 51% the previous week. The refinance share is at its lowest level since July 2009. The adjustable-rate mortgage (ARM) share of activity remained unchanged at 8% of total applications. The average contract interest rate for 30-year fixed-rate mortgages with conforming loan balances ($417,000 or less) remained unchanged at 4.49 percent, with points decreasing to 0.38 from 0.50 (including the origination fee) for 80% loans. The average contract interest rate for 30-year fixed-rate mortgages with jumbo loan balances (greater than $417,000) decreased to 4.37 percent from 4.41 percent, with points decreasing to 0.14 from 0.34 (including the origination fee) for 80% loans. The average contract interest rate for 30-year fixed-rate mortgages backed by the FHA decreased to 4.17 percent from 4.20 percent, with points decreasing to 0.10 from 0.41 (including the origination fee) for 80% loans. The average contract interest rate for 15-year fixed-rate mortgages decreased to 3.53 percent from 3.55 percent, with points decreasing to 0.31 from 0.33 (including the origination fee) for 80% loans. Already this morning the MBS market has shown high levels of volatility. It is the same story, the 10 yr note is coiling like a pissed off rattler, the narrowing trading range is something to follow carefully; the bulls and bears are balanced now. Once the balance shifts the move will be rapid in the direction of the breakout, the deeper look remains the same; the overwhelming consensus is for rates to increase. So far that view has remained but real money in the real market caps any of the near term comments. We believe rates will eventually increase but price action over the last four months doesn’t agree at the moment.